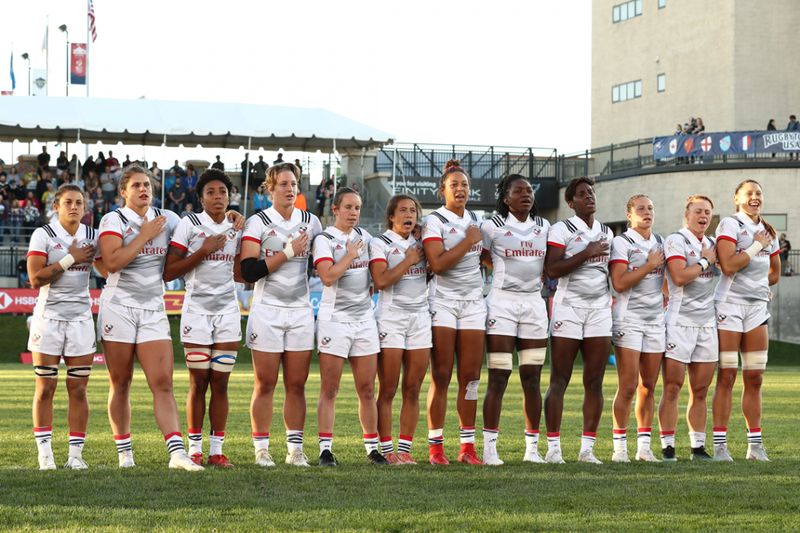 USA Rugby has recorded a massive weekend in international competition with eleven achievements across three national teams in sevens and fifteens. From Thursday, Jan 31 to Sunday, Feb 3 the United States won two medals in rugby sevens, sealed a 71-8 road victory against Chile in rugby fifteens and saw eight players claim individual benchmarks on the world stage. In the HSBC World Rugby Sevens Series -- the main route for qualification to the Olympic Games Tokyo 2020 -- Team USA's Men's and Women's Eagles Sevens both finished on the podium. The Men's Sevens made history by winning their fourth straight Silver medal at the HSBC Sydney Sevens tournament and are now the only men's team to medal at every competition this season. USA remains tied at No. 1 in the World with 2018 World Cup Champions New Zealand. The team has now maintained it's No. 1 ranking all season, having never reached or maintained such a high position in previous seasons. 2016 Olympians Folau Niua and Carlin Isles set their own unique marks with Niua becoming USA's most capped sevens player at 63 tournaments and Isles surpassing 150 career tries. In total, two Men's Sevens players made the coveted tournament Dream Team in 2016 Olympic Captain Madison Hughes and Stephen Tomasin. Five USA sevens players have made the Dream Team in the last two competitions. On the women's side, the United States won a Bronze medal at the same HSBC Sydney Sevens tournament, tying their record for most medals won in a single season. The women are now ranked No. 2 in the world with only three tournaments remaining in their Olympic qualifying year. USA player Naya Tapper set a record of her own when she scored her 65th try and passed 2016 Olympian Victoria Folayan as the Women's Eagles Sevens all-time leading try scorer. New player Kristi Kirshe also shattered expectations by scoring five tries in her first tournament with the national team. Previously a star soccer player at Williams College, Kirshe has been playing rugby for less than a year. While USA's rugby sevens teams currently sit at No. 1 and No. 2 in the world, the U.S. Men's National Team in fifteens opened their World Cup year with a smashing result. On Saturday, in the Americas Rugby Championship 2019, the Men's Eagles defeated Chile 71-8 on the road to open their quest for a third straight title in the biggest rugby fifteens tournament in North America. The Eagles scored 11 tries in the game and are currently ranked a record-high No. 12 in the world. The ARC tournament serves as critical preparation for Rugby World Cup Japan 2019 kicking off this September. On the men's side, Rugby World Cup is the third-largest single-sporting event in the world. During the match, USA player Joe Taufete'e tied the international test record for most tries scored by a front row forward. Taufete'e is now one try away from breaking the record (15 tries) currently shared with veteran Irish player Keith Wood. Where Wood set the mark in 63 appearances, Taufete'e has matched it in only 20 appearances with USA. The athlete is 26 years old and began playing rugby at age 18. Alongside Taufete'e, Eagles player AJ MacGinty was named Americas Rugby Championship Player of the Week for the three times he soared across the tryline to nail a hat trick in the victory over Chile. The Men's Eagles in fifteens will face Argentina XV in the second round of the Americas Rugby Championship 2019 this Saturday, Feb. 9 at 3 PM ET. Following the match, the team will rest for a bye week before coming home for three consecutive matches in Austin and Seattle to close out the tournament. Tickets for home games against Brazil (Feb 23), Uruguay (Mar 2) and rival-Canada (Mar 8) are available at usarugby.org/tickets. All USA games will be broadcast LIVE on FloRugby. The Men's Eagles Sevens will next compete at HSBC USA Sevens in Las Vegas, Mar 1-3. Last year, the team made history by winning their first-ever gold medal on home soil at the tournament. Tickets are available at usasevens.com/las-vegas/tickets with all games broadcast LIVE on ESPN+. The Women's Eagles Sevens will next compete at HSBC Kitakyushu Sevens in Japan, April 20-21 (local time). All matches are broadcast LIVE on facebook.com/worldrugby7s.